The Group's operating profit was EUR 43.3 (65.4) million. Comparable net sales fell by 3.6 per cent. A total of 117.9 million passenger trips were made. The quantity of train journeys rose by 9.0 per cent. VR Transpoint’s transport volumes rose to 41.3 million tons (+7.6 per cent). VR Group's Board proposes paying a dividend of EUR 90 million to the state. ‘In 2016 we succeeded in growing both the number of passenger journeys and VR Transpoint’s transport volumes. Also, VR Track’s construction business activities in Finland saw positive development. The Group's result was not, however, at a satisfactory level owing to the poor result of VR Track’s Swedish subsidiary. Competitiveness development continues, using both already active and newly formed development programmes,’ VR Group President and CEO Rolf Jansson commented. In 2016, a total of 117.9 million passenger trips were made. The number of journeys rose by 6.7 per cent compared to the previous year. VR Transpoint’s transport volumes increased by 7.6 per cent compared to the previous year, totalling 41.3 million tonnes. In Finland, VR Track's construction business net sales saw a rise of 11.1 per cent on the previous year. The Group’s net sales in 2016 were EUR 1,186.7 million (EUR 1,231.4 million), a decrease of 3.6 per cent on the previous year. Most of this change can be accounted for by the lowered price level for long-distance passenger services. VR Group posted an operating profit of EUR 43.3 million (EUR 65.4 million). Operating profit was strong in all Finnish business operations. VR Group’s result was weakened significantly, however, by the losses experienced by VR Track’s Swedish subsidiary VR Track Sweden. VR Passenger Services recorded an operating profit of EUR 16.6 million (EUR 9.9 million). Net sales for passenger services was EUR 502.0 million (EUR 534.8 million), which represents a drop in net sales of 6.1 per cent. Net sales for train transport fell by 7.9 per cent, and bus and coach transport sales fell by 1.3 per cent. Net sales for restaurant services provider Avecra rose by 2.2 per cent overall, primarily thanks to the increased passenger numbers. The filling rate for market-based traffic clearly increased, rising to 41.7 per cent (34.1 per cent). Travel by train rose by 9 per cent, with a total of 82.1 million train journeys made. For long-distance traffic, journey numbers increased by 2.8 per cent in spite of the significant cuts in LVM contract traffic. The quantity of market-based long-distance journeys rose by 8.4 per cent. The number of journeys made on Allegro services between Finland and Russia increased by 8.2 per cent. Commuter traffic journeys rose by 10.2 per cent, in large part thanks to the Ring Rail Line. A total of 35.8 million bus and coach journeys were made, representing an increase of 1.7 per cent on the previous year. The competitiveness programme initiated in 2015 for increasing the operational efficiency of long-distance traffic and decreasing ticket prices led to savings of EUR 41.9 million in expenses. The set goal of EUR 50 million of expenses saved will be achieved in full during 2017. The increase in passenger numbers has continued during the start of 2017. During this year, VR will provide passengers with new services: restaurant wagons and the seat reservation system will be upgraded and the first travel chain pilot projects will be brought onto the market. VR Transpoint’s net sales totalled EUR 380.7 million, representing an increase of 0.1 per cent on the previous year. Net sales in rail logistics grew by 3.0 per cent, but net sales in road services declined by 9.6 per cent compared to the previous year. The drop in net sales for road services resulted partly from the sale of Transpoint International’s Hungarian subsidiary in 2015. VR Transpoint posted an operating profit of EUR 34.5 million (EUR 27.0 million). VR Transpoint's total transport volumes in 2016 rose 7.6 per cent from the previous year's levels, totalling 41.3 million tonnes (38.4 million tonnes). VR Transpoint’s transports consist primarily of raw materials and products for the mechanical and chemical forest industry and the metal, construction and chemical industries. Rail logistics transports saw the largest growth in imports and transits from the East and domestic forest industry transports. The first new electric locomotives, which will start commercial operations this year, will be available for use in rail logistics. It is expected that investments in forest industry will further increase transport volumes. The increase in volumes has continued during the start of 2017. VR Track’s net sales were EUR 294.3 million (EUR 300.5 million), which represents a decrease of 2.1 per cent on the previous year. VR Track’s operating result was EUR −14.1 million (EUR 18.1 million), of which VR Track Sweden’s share was EUR −35.6 million. The loss resulted primarily from one project undertaken by VR Track’s Swedish subsidiary VR Track Sweden AB. It has been agreed with the client that this project be concluded in April 2017, ahead of schedule. The five-year project’s projected losses have been recorded into the 2016 operating result, so the project will no longer burden VR Track Sweden’s result. VR Track Sweden is currently implementing a change programme for developing profitability. In Finland, VR Track's construction business activities developed positively, with net sales rising by 11.1 percent compared to the previous year. Business related to infrastructure project planning also developed well, seeing a rise of 14.2 per cent in net sales. (EUR 119.8 million). Leasing agreements accounted for EUR 21.5 million (EUR 29.8 million) of total investments. Expenditure on rail rolling stock totalled EUR 59.0 million (EUR 70.6 million). The most important investments comprised new control and sleeping cars for passenger services, bus purchases for Pohjolan Liikenne and rolling stock for VR Transpoint. The impact of investment in new electric locomotives in 2016 was still relatively small but its impact will increase substantially in the coming years. The Board of Directors proposes to the Annual General Meeting that VR Group Ltd pay a dividend of EUR 90 million. The company's distributable profit totalled EUR 91.8 million. 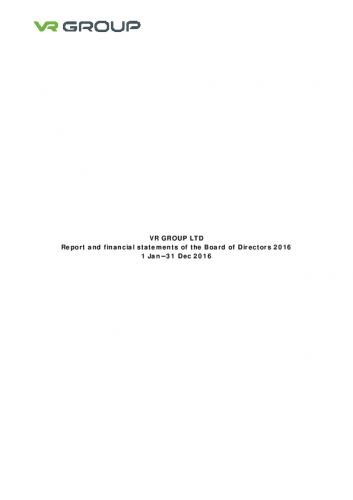 No fundamental changes have taken place in the Group’s financial position since the end of the financial year. The Group’s equity ratio at the end of 2016 was 68.8 per cent. VR Group is a versatile, environmentally friendly service company for travel, logistics, and infrastructure that operates responsibly. About 8,000 professionals work for the group. VR Group operates primarily in Finland, but it also has operations abroad, especially in Russia and Sweden.